For quite some time, the electric guitar has mystified people who don’t know how to play it. With a quick fling of your hand, you can strum the strings and make it seem as if you’re using magic. If you’re looking for a top electric guitar for beginners, get ready for an experience that will change your life for the better. At first, the journey into the world of guitars can seem incredibly daunting because there are countless models to choose from. Every guitar offers a unique style and fights to reduce the weight of your wallet. When shopping for electric guitars, there are several considerations to make. Guitars are made from different types of wood and have different pick-up combinations. Every model will look and feel different, and even if you purchased two identical guitars from the same manufacturer, the playing experience would be different. Top products from Fender or Gibson can easily set you back four figures, so price is a limiting factor for most people. When you’re completely new to guitars, it’s best to dive in and purchase beginner model that has been recommended to you. Once you’ve obtained some experience, you can begin to customize and look into better models. Below, you’ll find a list of the top 10 electric guitars for beginners. Although it’s significantly more expensive than many other guitars for beginners, this is a top model to start with. Since it’s inspired by Les Paul, who is a famous guitarist, you can trust that your journey is in good hands. Many experts would consider this guitar to be an evergreen model because it’s great for beginners and experienced players. The higher price of this guitar means you can stick with it for several years before upgrading. As you become more experienced, you’ll be able to produce better sound with the Les Paul standard guitar. It features a maple top and mahogany body. It also has a rosewood fretboard and Alnico Classic humbucker pickups. With the high price, everything about this electric guitar is quality. Most players would use the word outstanding to describe this guitar. It offers all of the classic features that you should expect from an electric guitar. The solid mahogany body is more than beautiful, and the maple top delivers and sustains the classic tone that you would expect from Les Paul products. Unlike some of the cheaper beginner guitars, the Epiphone Les Paul Standard has a 14 degree headstock, which delivers significantly more pressure at the nut than inferior models. Here is another excellent electric guitar for beginners. It’s a classic model and has been designed to fit the needs of every player. If you want the ability to say you’re a proud Telecaster owner, then you can get this guitar for a great price. This electric guitar offers far more functionality than what is needed for beginners. However, since it has much more to offer, you can still use it to learn and won’t have to upgrade for several years. The Fender Modern Player Tele® Plus Electric Guitar packs incredible sound versatility and features a humbucking bridge pickup. It also has a strat middle pickup and lets you play with several different tones. It has a radius of 9.5” and offers 22 jumbo frets. Since this guitar is built to play fast, you’ll be able to play plenty of different songs. It features a coil-splitting mini toggle and offers 5-way switching. 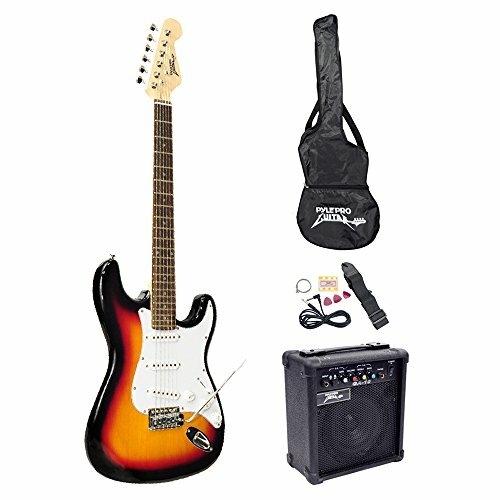 Overall, this electric guitar is great for beginners but can work just as well for experienced players. 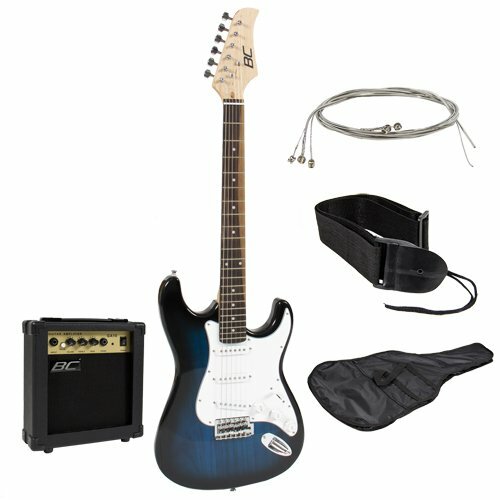 If you’re looking for a beginner guitar kit, the Full Size Blue Electric Guitar from Best Choice Products is a great package to consider. It features a metallic blue finish and has a neck made of maple wood. You get a single coil X3, and the guitar comes with a small 10 watt amp. The length of this guitar is 39 inches, and the beginner package comes with everything that you need to start playing guitar immediately. The package also comes with important accessories, so you don’t have to waste time purchasing them separately. Since the guitar is well-built and delivers the basics, this is a great package for beginners. You can purchase this guitar for personal use or give it away as a gift. A top package for beginners is the Pyle-Pro PEGKT15SB. It features a beautiful sunburst color and sports a basswood body. It has three pickups and several other controls. You get three single pickups, which have metal strings. The fretboard is made of rosewood, and the neck is made of Maplewood. This particular package comes with an amplifier and several accessories. If you’re a complete beginner and want to start rocking an electric guitar, you need to consider getting this package. 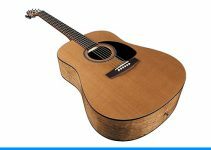 The solid-body, double-cutaway guitar is made of high-quality materials, which are important for producing a clear, rich tone. Although the included amp is only 10 watts, it’s enough to get you started and help you appreciate the thrill of playing an electric guitar. A simple, beautiful beginner guitar is made by Dean V Dave. Although its purpose is very simple, this guitar is incredibly awesome. It’s designed to keep you comfortable while playing for several hours at a time. You get swift movement and amazing sound output. When taken to extreme levels, the sound output from this guitar will push your pedal or amp to the limit. Many cheaper beginner guitars deliver a distorted pitch. 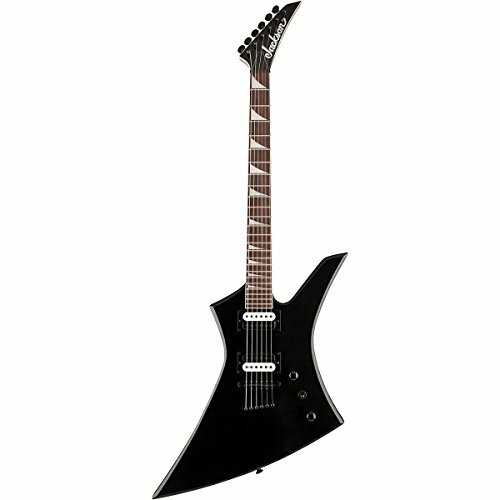 The Dean V Dave Mustaine Guitar Bolt-on guitar doesn’t produce distorted sound. When you play this guitar, you’ll be blown away by its genuine metal tone. 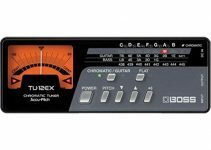 It’s an excellent guitar for beginners, and if given as a gift, the receiver will believe you spend much more money than you did. Here is another top electric guitar for beginners. If you want to escape the poor sound quality offered by many cheaper guitars, the Yamaha Pacifica Series PAC112V is a great product to consider. Since the Yamaha Pacifica Series is designed for beginners, your beginner needs are in good hands. This electric guitar comes with everything that you could need. With an alder body and maple bolt-on neck, this guitar feels strong and produces incredible sound. It features a rosewood fingerboard and vintage tremelo. A coil tap and 5-position switch makes it easy to use and produce genuine sound. For over a decade, this has been one of Yamaha’s best-selling guitars for beginners. It’s known for outstanding playability and great tone. 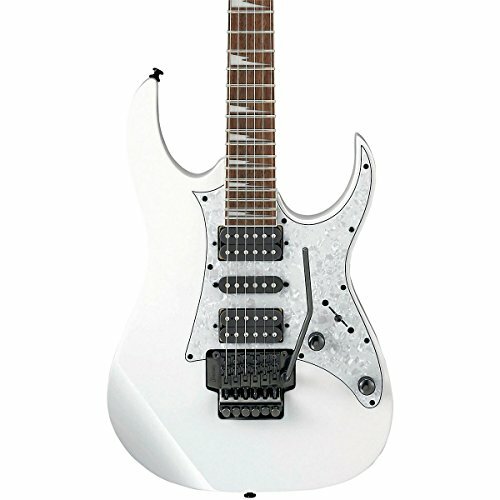 Another great product for beginners is the Ibanez RG450DX. As one of the most recognizable products from Ibanez, many consider this guitar to be a flawless masterpiece. It offers state-of-the-art sound versatility and quality, which is made possible by the high-end hardware that it’s equipped with. It took a long time for Ibanez to get this model right, and over time, it has been honed for strength and speed. With a basswood body and Wizard III neck shape, this beginner guitar offers superior speed and comfort. The rosewood fingerboard is equipped with 24 jumbo frets, so you get even bigger note bends. Overall, this is a top electric guitar for the complete beginner. When looking for the perfect product to start your journey, the Jackson JS32T could be one of the most stylish options available. 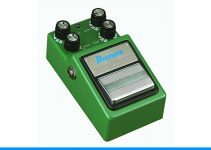 It delivers great mid and high-gain tones, which can really challenge your amp. For optimal style, it’s designed with a beautiful Z shape. This electric guitar plays just as good as it looks. It features a body made of Indian Cedro, and the Kelly body shape will keep you fascinated. With 24 jumbo frets, you get plenty of playing power. It even has MOTO shark fin position inlays. The price of this guitar might make you think you’re getting a low-quality guitar, but in reality, you’re getting one of the best models for beginners. Here is another top model for beginners. Once you’ve had time to play guitar for a while, you’ll start to realize that most of the high-quality guitars on the market are from Epiphone. Although these guitars are very affordable, they don’t lack quality. In fact, all Les Paul guitars carry a certain standard of quality, which is especially important for beginners. This particular guitar simplifies the user experience while delivering excellent tonal adaptability and versatility. It features 700T humbucker pickups and rosewood fretboard. With a maple top and mahogany body, this guitar produces beautiful sound and will have you playing for hours at a time. For quite some time, the Squier Classic Vibe 50’s Stratocaster has been a top electric guitar for beginning guitarists. It has been a dream model for most beginners because it’s quite expensive. If you like Epiphones but want a Fender, this is a great product to consider. Although it has three pickups, you shouldn’t be intimidated. Some might even say that this guitar is too complex for a beginner. Once you grasp it in your hands, you’ll never want to touch a cheaper beginner model. It features a beautiful gloss polyester finish and alder body. The price keeps this product out of reach for many beginners, but for those who can afford it, the Squier Classic Vibe 50’s Stratocaster won’t disappoint.